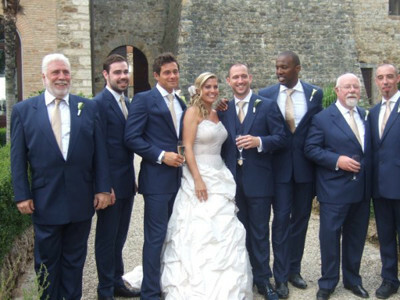 Henry Herbert was privileged to make a wedding suit for Tim Boyce (pictured), a broker at ICAP and the six suits for his six best men. The wedding took place in Italy and we chose a lightweight pure blue, English wool from Dugdale to cope with the higher Italian temperatures. Each man was measured individually and each pattern was cut individually, allowing us to cater for the variety of heights, shapes and sizes. They all looked terrific. See also: best men, broker, Henry Herbert, Henry Herbert Tailors, Italy, savile row tailor, shapes and sizes, Shirts, suit, Suits, svene, Tailored Suits, Tim Boyce, wedding, Wedding Suit, wedding suits. Savile row wedding suits by Henry Herbert Tailors. Wedding suits for a groom and his six best men, made from a lightweight English wool to account for the warmer temperatures in Italy.